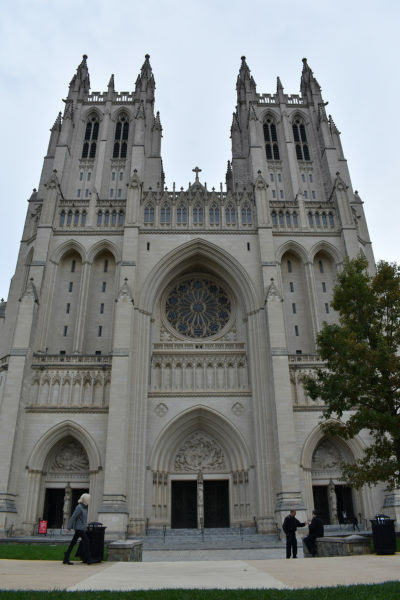 [Episcopal News Service] An upcoming outdoor festival on the grounds of Washington National Cathedral will celebrate refugees and their contributions to American culture, cuisine and communities. The One Journey Festival, to be held June 2, is the most prominent product yet of an initiative that has grown out of the work of a small group of Episcopalians at a congregation in Virginia who were concerned about the increasingly negative depictions of the refugees coming to this country. Chan, a member of St. George’s Episcopal Church of Arlington, Virginia, was a teenager when she and her family came to the United States to escape political turmoil in her native China. Fellow parishioner Norma Kacen is the granddaughter of Italian immigrants who often faced prejudice as they struggled to assimilate. Chan and Kacen were the driving force behind Northern Virginia Friends of Refugees, a ministry of St. George’s that has grown into a national interfaith network of 650 members and has received support from more than 130 faith communities, organizations, agencies and businesses that want to stand with refugees. Together, they are inviting the public to join them in a daylong festival in Washington, D.C.
From 11 a.m. to 6 p.m. June 2, One Journey will feature food, fashion, music, art and dance provided by refugees and immigrants, including chef José Andrés and actor Ger Duany. Attendees will be able to connect with refugees oversees through an audio-video “portal.” Children can learn about refugee cultures in the “Next Gen” tent, while a “Take Action” booth will provide ways for adults to add their voices in support of refugees. “It’s so important for members of our communities, members of our faith communities [to be] standing up and speaking with a loud voice that we are a welcoming people,” said Allison Duvall, manager for church relations and engagement with Episcopal Migration Ministries, which is a sponsor of the One Journey Festival. 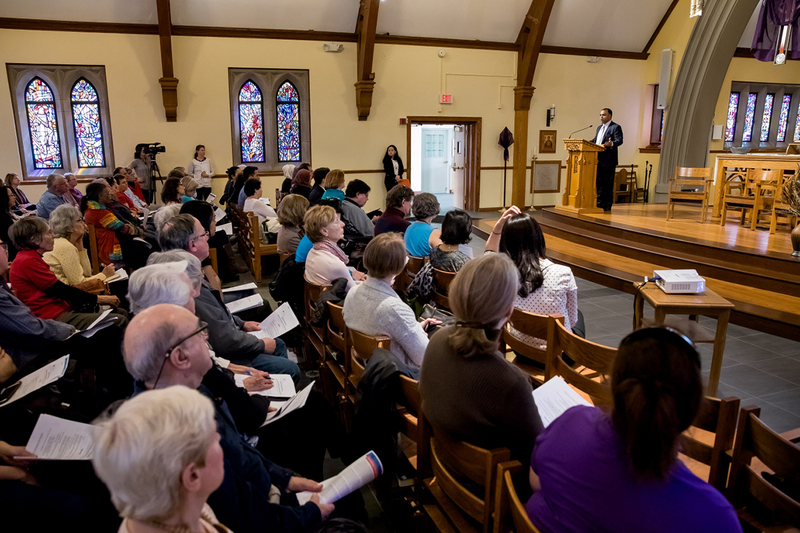 Episcopal Migration Ministries is one of nine independent agencies with federal contracts to resettle refugees on behalf of the State Department. The resettlement program aims to assist vulnerable populations around the world, especially those fleeing war and violence. More than 65 million people worldwide have been forced to flee their homes, according to the Office of the United Nations High Commissioner for Refugees, or UNHCR, and the United States traditionally has been the most welcoming nation in the world for refugees. That welcome has diminished, however, since President Donald Trump vowed in 2017 to reduce refugee resettlement totals and block entrance from certain countries altogether. While President Barack Obama increased refugee resettlement to 85,000 in 2016, the number has plummeted since then, with the United States on track to resettle only 20,000 refugees this year. “This is a challenging moment for the people who do this kind of work and the people we serve,” Duvall said. Her agency, which just two years ago was working with 30 affiliate agencies in the boundaries of 26 Episcopal dioceses, is now down to just 14 affiliates in 12 dioceses. The plight of Syrian refugees fleeing to Greece to escape their war-torn homeland is what first caught the attention of Chan and Kacen, particularly the image circulated worldwide of a 3-year-old Syrian boy lying dead on a beach in 2015 after the boat carrying his fleeing family sank. In April 2016, the Diocese of Virginia invited Duvall to lead a workshop about refugee resettlement efforts and how to support them. Chan and Kacen attended, and the experience further inspired them to form Northern Virginia Friends of Refugees. One of the group’s first efforts was to organize a three-session educational forum about refugees in summer 2016. It was held at St. George’s, and people of all faiths were invited. Nearly 200 people attended, which signaled to the organizers that the issue was resonating. As their efforts gained momentum, they felt a greater sense of urgency amid the growing anti-immigrant rhetoric from Trump and his supporters. A “Raise Your Voice” workshop was held in March 2017 to promote political advocacy in support of refugees, and the Friends of Refugees group also worked to arrange job mentoring for refugees, enrichment activities for their children and welcoming atmospheres at local medical facilities. The One Journey Festival builds on that work while seeking to reach a broader audience. It started as a simple idea — a day for showcasing refugees — and it has grown into something much bigger, thanks partly to Washington National Cathedral’s willingness to host the event. About 30 people have been working on the festival over the past nine months. Chan and Kacen hope the idea can be replicated in other parts of the country by dioceses and congregations interested in showing their support for refugees. Kacen said the ultimate goal is to present “an alternate vision of refugees,” a positive vision that focuses on the refugees’ own stories. Lovely! I wish I could be there. It sounds like little St. George’s Arlington has planted a mustard seed. Well done, St. George’s, well done! While this is an excellent step forward, it sadly though this ignores the needs of asylum seekers who are not able to access any federal government support while they wait years for their cases to be adjudicated. A very praiseworthy event to raise awareness and appreciation for a vital ministry. Would love to be able to attend!